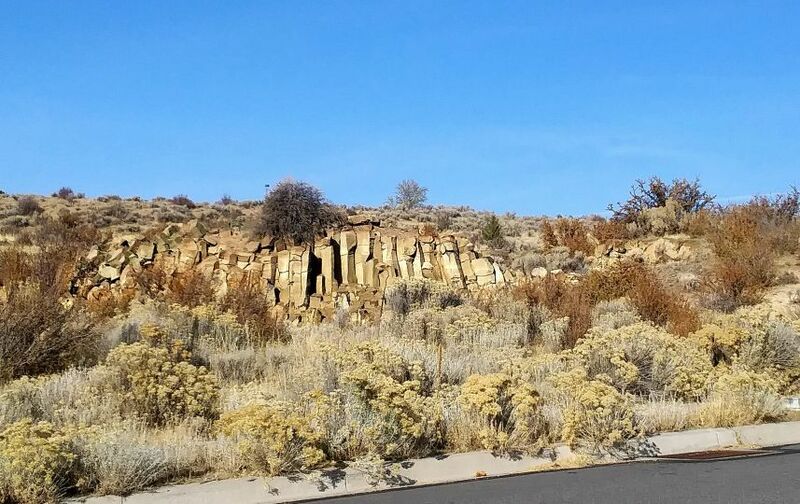 There is a hill north of Klamath Falls, Oregon, that consists of sections of sandstone columns, interspersed among ordinary soft sandstone. They were confusing (to this non-geologist) because they were not the usual black/grey of basalt columns. This website explains that these are indeed formed in proximity to volcanic activity, of which there has been a lot in the ancient past here, but I don't understand the explanation well. It seems that sandstone columns are found around the world, but are rare. Perhaps a geologist in the room could elaborate. Take a look at the two locations in the folder below, click the one at Hwy. 97 to see a great cross section of the hillside. Columns on top, pale, crumbly sandstone below. Chunks fall to the highway quite often, but they seem to come to a dead stop before reaching the asphalt.